Finally, an affordable high-speed rail technology! Flight Rail Corporation is pleased to announce an elevated high-speed rail system propelled by air pressure within a sealed power tube underneath the train. Power is supplied by stationary vacuum power systems located along the line, as far as 50 miles apart. The patented system is projected to operate at speeds in excess of 200 mph and to climb grades as steep as 10%, more than three times steeper than a conventional train can climb. The system is a very light-weight, affordable high-speed rail system. It's the high-speed rail technology we can all afford. First of all, we should mention that all of the images and videos on this site are REAL! We believe in building, not just modeling. So, we actually built a 1/6 scale working prototype of the train to demonstrate our technology in practice. 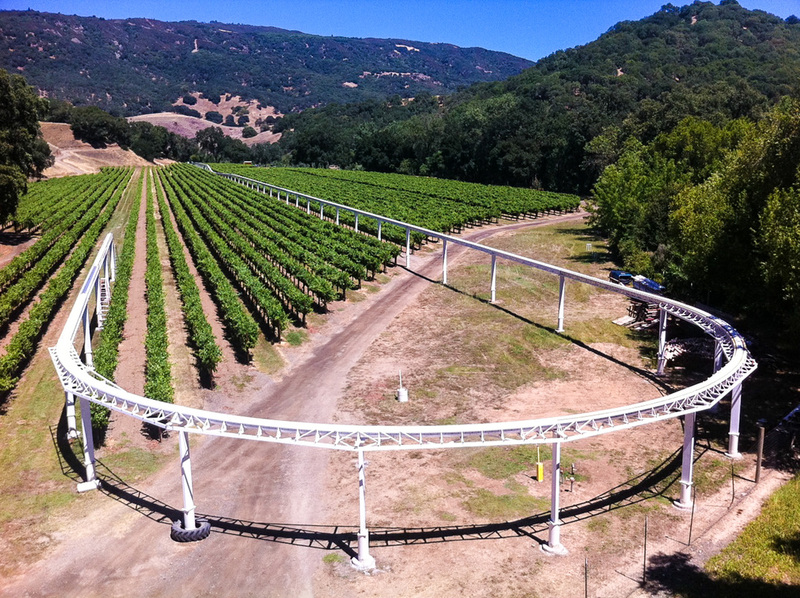 We call it VECTORRTM, and it is currently operating on a 2,095 foot (638 m) outdoor test guideway in Mendocino County, California. In 2016, we are continuing forward with development of the technology. We are starting to build some full scale components. And we are seeking a partner to build out a full-scale demonstration track. If you are interested in watching our progress, follow our blog. Learn about the background of our founder and the origins of the VECTORR project on our About page. There is also a contact form if you want to get in touch, and a few downloadable documents containing more technical information for the data-geeks out there.